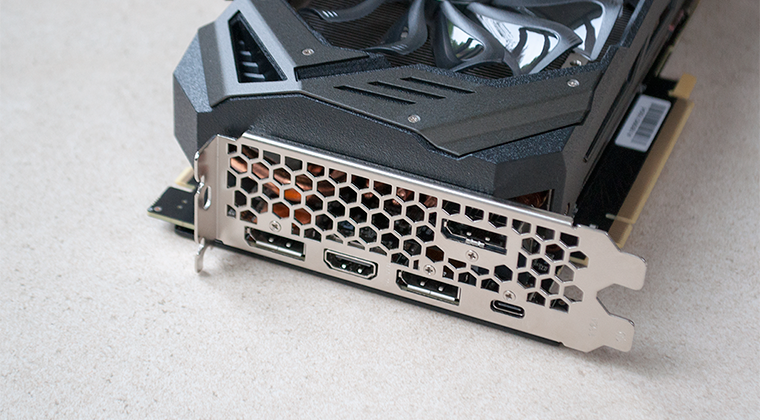 We have the privilege of playing with all sorts of cutting-edge tech here at HEXUS HQ, but few things excite us quite as much as a new graphics card architecture. 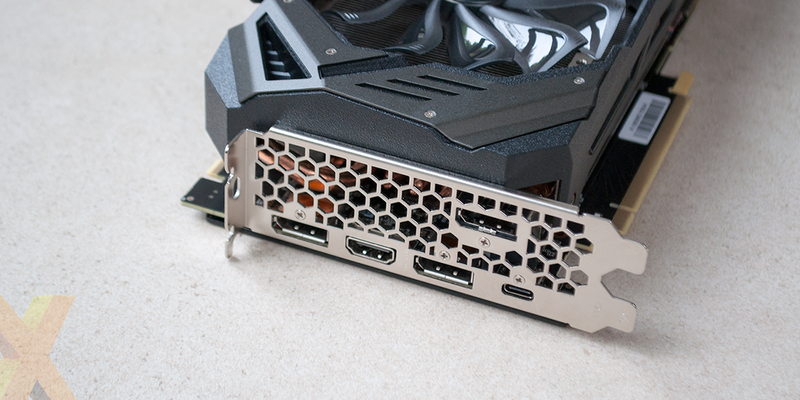 Testing Nvidia's latest GPUs has been both fun and informative, yet while we've been left suitably impressed by the top-of-the-range GeForce RTX 2080 Ti, the jury's still out on the second-tier RTX 2080. It's a mighty chip, there's no doubt about that, however the price tag is far from inviting, and though forward-looking features such as ray-tracing and DLSS sound impressive on paper, there aren't yet any games that unlock the potential of the Turing architecture. Heck, when evaluated using current titles, RTX 2080 doesn't perform significantly better than the previous-generation GTX 1080 Ti. Is there good enough reason to consider upgrading to RTX 2080 right now? That's debatable, but one thing we know for sure is that Nvidia hasn't made it easy for partners to create compelling custom cards. The reason for that is that Nvidia's own Founders Edition has been upgraded with a new dual-fan cooler and a factory overclock as standard. 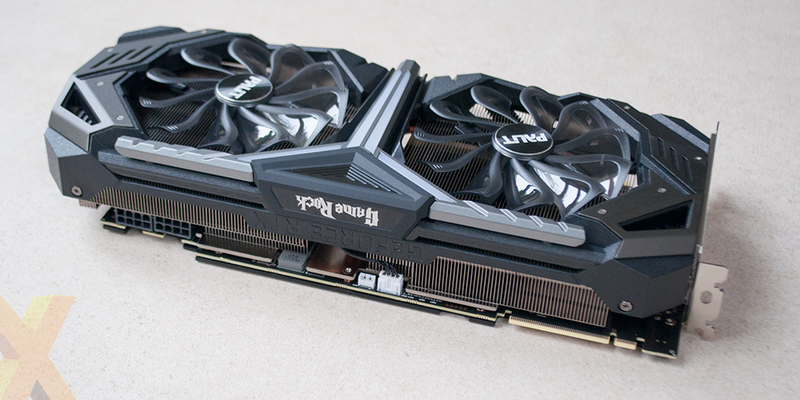 We've handled our fair share of graphics cards over the years, and we can say without any doubt that the RTX Founders Editions are the most exquisite to pass through our labs. Build quality, design and appearance is about as good as it gets, and traditionally popular alternatives from the likes of EVGA and Gigabyte now look and feel plasticky in comparison. 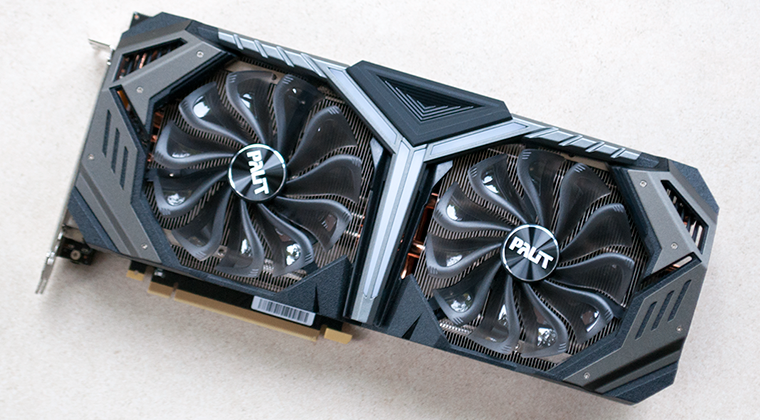 Palit faces the same challenge with its RTX 2080 GameRock Premium Edition. The card's giant shroud looks like something you would get if you crossed a transformer with an owl, and the end result isn't particularly pleasing to the eye. It's an acquired taste, to say the least, yet even if you happen to love the design, the choice of construction material leaves something to be desired. The shroud is made primarily of plastic that flexes all too willingly, and simply isn't befitting a product of this ilk; such coolers have sufficed for many years, but Nvidia's Founders Edition has raised the bar, and we get the feeling the days of plastic coolers on premium products are numbered. Look past the awkward frontage and there are some good features on offer here. 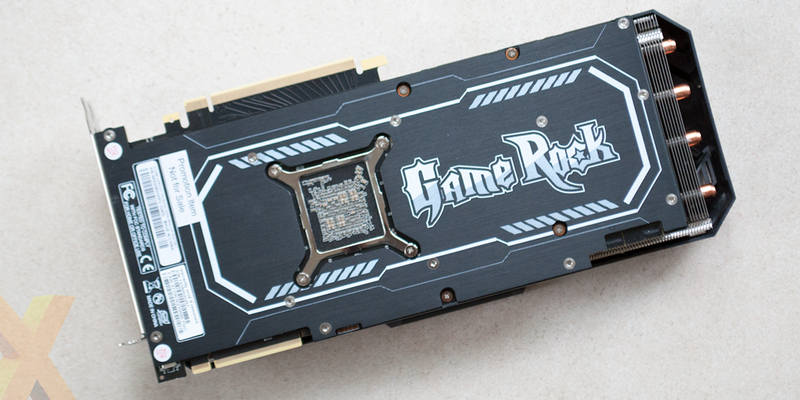 The backplate, albeit sprawled with exaggerated GameRock branding, is a thick sheet of metal that covers almost the entire PCB and adds such much needed rigidity to a card that tips the scales at 1,328g. It's a beast alright, and is sized as such, measuring 292mm in length, 130mm in height, and occupying the best part of three expansion slots. Thankfully those generous dimensions haven't been wasted. Palit is using a larger copper contact plate this time around, and five thick copper heatpipes traverse a near-full-size heatsink said to be carrying 22 per cent more fins than the previous generation. 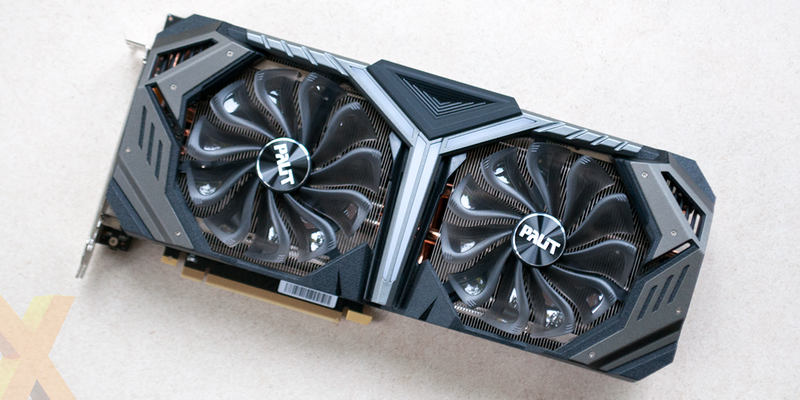 Both fans are designed to switch off at low load, and given the size of the cooler, it's no surprise that Palit ships with the highest factory overclock we've tested on an RTX 2080. Right out of the box, boost clock is raised to 1,875MHz, up from 1,800MHz on the Founders Edition, though the 8GB GDDR6 frame buffer is kept to the default 14,000MHz. Tinkering potential is aided by dual eight-pin power connectors, and if you do land yourself in trouble, the dual-BIOS implementation gives you a fallback at the flick of a switch. Palit clearly has one eye on speed, but we do wish a little extra care had been taken by the design team. 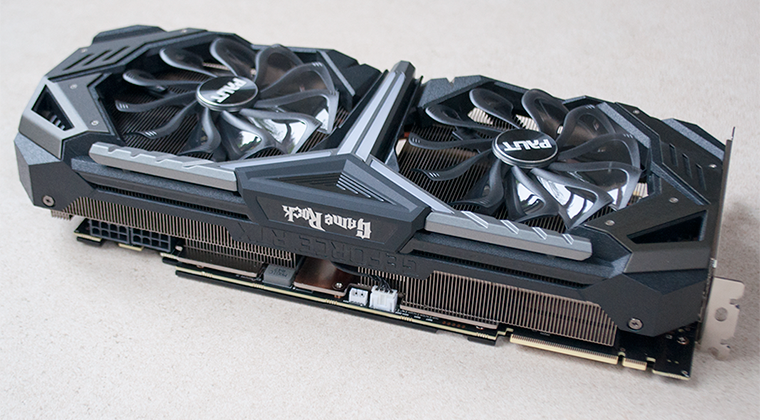 On the one hand, who cares how a graphics card looks? On the other hand, did the bright-white fan header really have to go on the top edge, where it sticks out like a sore thumb? A question mark also surrounds the implementation of RGB LEDs. We were surprised to find that the GameRock logo on the top edge isn't backlit. Instead, the T-shaped accent on the front of the card is where the illumination occurs. What this means is that unless you have the graphics card vertically mounted, you'll never actually see the lighting, rendering it pointless for the majority users. Historically, Palit's cards have been deemed attractive due to price tags that tend to undercut most of the competition. 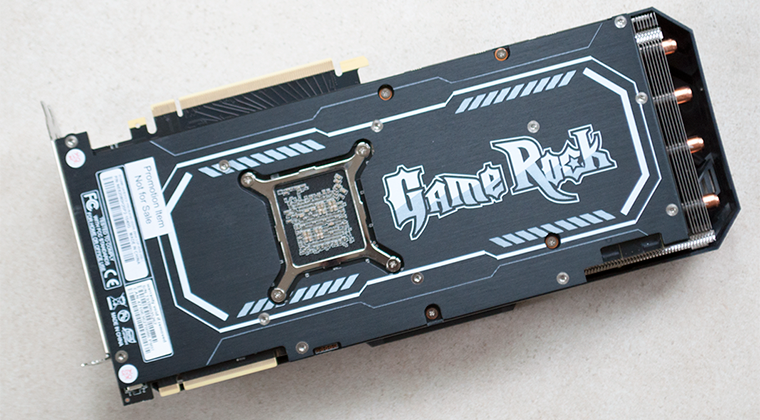 That's partly the case this time around, as the firm's smaller, lower-clocked RTX 2080 GamingPro is one of the more affordable custom variants on the market, but the same can't be said for the GameRock Premium Edition, which at the time of writing is listed at £830. Is the 10 per cent premium over the Founders Edition warranted? Let's run through the benchmarks before passing judgement.